Get your share of the newborn photography market. The display holder gets attention, but takes up only a small amount of counter space. It contains two-part marketing pieces that new moms can't resist! 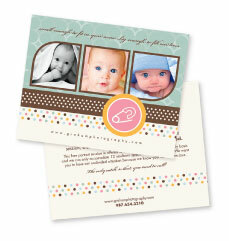 The marketing card, which features your images, photography marketing message and special offer, is tucked into an adorable die-cut "diaper" carrier that shows through a translucent 5 3/4 x 4 3/8 envelope. This piece is bound to intrigue and impress expecting parents or new parents, as well as your marketing partners.! The display and photography marketing pieces feature cheerful graphics that are designed to harmonize with a range of photographic styles . . . from classic to photojournalism. This allows you to achieve the impact of a boutique studio promotion without busting your budget! If you have access to a list of pregnant women or new parents, then you can mail the marketing piece as well. Want to customize even more? Please call for a specialized quote. at (800) 228.0629 to order now.